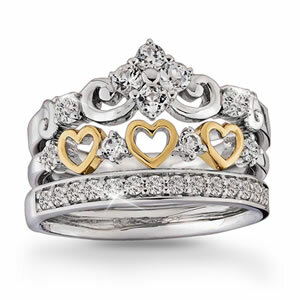 Rule your world as you wear these charming gem laden stacking rings crafted in solid Sterling Silver and laden with sparkling White Topaz, ­ a delicately sculpted petite tiara, a band of golden hearts, and a 1/4 carat White Topaz pavé band ring ­ all combining to become a royal crown that will make you feel like a queen. ORDER THE COMPLETE 3-PC. SET and SAVE!